In four years, the Cleveland Torso Murderer killed, dismembered and castrated 12 different victims, and was never identified. Investigators look at the dismembered head of one of the victims. 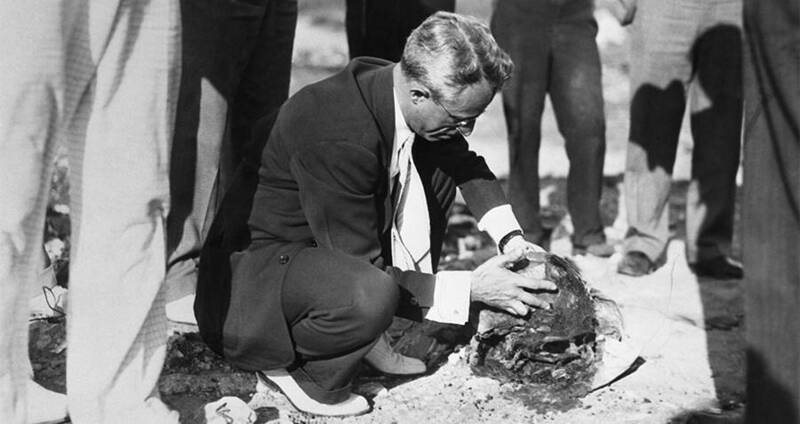 The first body appeared in September 1934. A young man discovered it while walking along the shores of Lake Erie, though by the time he found it, it could hardly be considered a body. More like part of one. The remains discovered were that of a woman’s lower torso, amputated at the knees. A chemical was present on the skin that turned it red and leathery. The rest of the body was never found, and the woman was never identified. She was dubbed the “Lady of the Lake,” and taken to the morgue, left forgotten until years later when detectives noticed she fit almost perfectly into a local serial killer’s pattern. One year after the first body had been found, another corpse was discovered. Two teenage boys found the decapitated body of a man, at the bottom of a hill in Kingsbury Run. The body was identified as 28-year-old Edward Andrassy. He was wearing only a pair of socks. The discovery of Andrassy was the second in a long line of bodies discovered in Kingsbury Run that would be attributed to an unidentified killer known as “The Mad Butcher of Kingsbury Run,” and later the “Cleveland Torso Murderer.” He is often considered the first official victim, as the first woman found was not connected to the spree until later. To this day, no one has been convicted of the crimes. 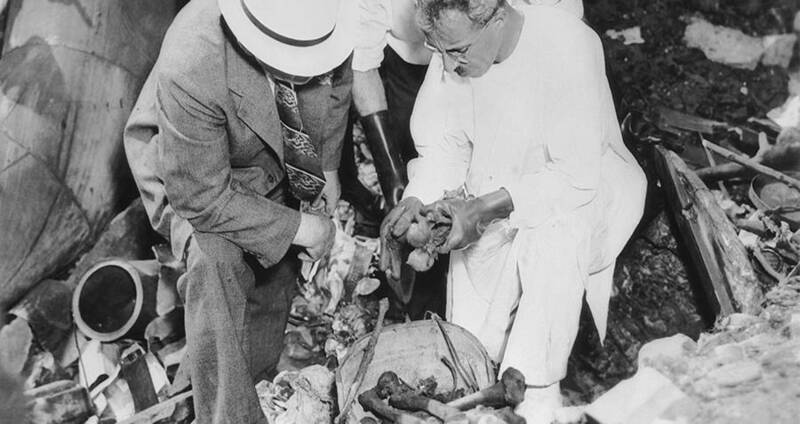 Between Sept. of 1934, and Aug. of 1938, 13 different bodies were found, all in the same condition — all missing heads and various limbs, and all hailing from the lower classes of society. In most cases, the cause of death was decapitation or dismemberment itself. Some of the bodies were found with their dismembered limbs near each other, and other’s took days to piece together, like a morbid jigsaw puzzle. Some of the body parts were never located. Bettman/Getty Images Investigators examine the bones of one of the victims. Only two of the bodies deviated from the usual MO. The body of victim nine was found eviscerated, the abdomen gutted and the heart ripped out. The body of victim 10 was found with drugs in her system, though due to the absence of her arms the possibility that she had been an addict was not ruled out. Of the 12 victims, only three were ever identified, and only two of them positively. 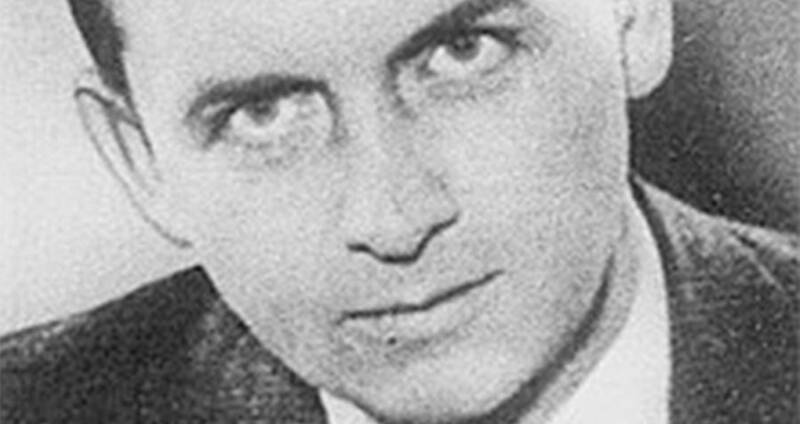 The first was Edward Andrassy, the first body found. The third body found was identified as Florence Polillo. The eighth body found was thought to be Rose Wallace, though her identity was only confirmed through uncorroborated dental records. The investigation into the murders carried on for five years officially, culminating in only two major arrests, and no convictions. In 1936, while the case was still fresh and bodies were still being discovered, Safety Director Eliot Ness became heavily involved. Ness was well known at the time for heading up “the Untouchables,” a group of federal law-enforcement agents that worked to take down Al Capone, and it was believed that his savviness as a detective would bring fast closure to the case. In 1938, the last two bodies to be discovered were found in a dump site, wrapped in a man’s double-breasted blue blazer and an old quilt. It’s believed that the placement of the bodies was intentional, as the dump site was clearly visible from Ness’ office window. Two days later, Ness and a group of 35 police officers raided Kingsbury Run, home to the city’s most degenerate residents. They gathered 63 men and ended up burning down the shanty town after their raid. Though Ness was heavily criticized, and though the public believed that the violent raid would do nothing to stop the murders, no bodies were found after it. A few days after the raid, a doctor named Francis Sweeny was arrested with belief that he was the Cleveland Torso Murderer. Sweeny had been a medical soldier in WWI, responsible for field amputations. He was personally interviewed by Ness, and given two separate polygraph tests. He failed both of them. However, before he could be tried, it was revealed that Sweeny was the first cousin of Ness’s political opponent, Congressman Martin Sweeny. Ness realized there was no way he would be able to prosecute him successfully and was forced to let him go. The second arrest wasn’t much more successful. In 1939, Sheriff Martin O’Donnell arrested a bricklayer named Frank Dolezal for the murder of Flo Polillo, the eighth body to be found. O’Donnell had discovered that Dolezal had lived with Polillo for a time and that he was acquainted with Edward Andrassy and Rose Wallace, the only two bodies to be positively identified. Wikimedia Commons Death masks created in the hopes that members of the public could identify the victims. They were not successful. Though police initially claimed that Dolezal had confessed, there was speculation that he had either been coached or coerced. Before he could go to trial, Dolezal hanged himself in his cell. His autopsy revealed he had sustained six broken ribs while in O’Donnell’s custody. Later it was revealed that O’Donnell was the only one who believed him to be guilty as the Cleveland Torso Murderer. After the authorities ran out of suspects, and no more bodies were found, the case ran cold. 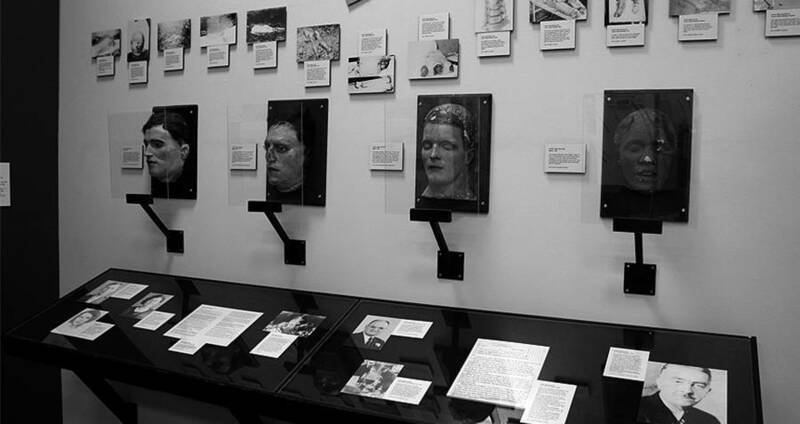 Since 1939, no new information has been found on the Cleveland Torso Murderer. 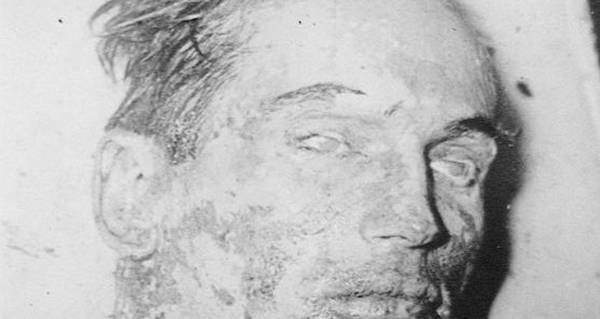 Enjoy this article on the Cleveland Torso Murderer? Next, read about the six creepiest unsolved murders in history. Then, read about the world’s worst serial killers.